This all new restaurant (in the former Maine Luau) will please the appetite of just about everyone. Great Maine seafood, pulled pork, ribs, chicken and prime rib slow smoked over a real pit BBQ – Texas style. 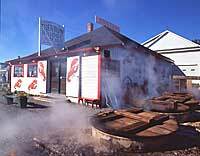 Have your lobsters cooked on site or get them packed for travel. The Dahlman’s ship lobsters for those that want to send along a taste of Maine to friends and family. Inside and outside seating. Open from 11 a.m. to 9 p.m. everyday through the summer season.